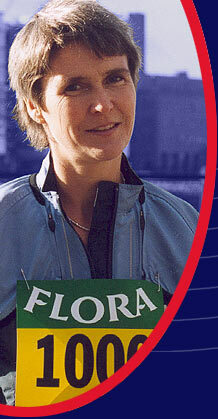 Super-athlete Sharon Gayter will take today's London Marathon in her stride . . . despite having just run 1000 miles in 1000 hours. The ultra-distance runner was expected to finish a six-week endurance event this morning. But despite the distance she's already covered, she is confident she'll manage the marathon in a time of three-and-a-half hours. The former bus driver said: "I'm raring to go. I am really excited and psyched up for the marathon. "I did an extra two-and-a-half hour run last week to practise my pace. "Although I have been running for six weeks it's only been a mile here and there and a marathon is 26 consecutive miles. "It'll be a challenge but I'm looking forward to it." Sharon, 39, from Guisborough, Teesside, is one of six athletes who started the 1000-mile event. One dropped out after a third of the distance. The runners' sleep patterns have been wrecked during the event, in which they have to cover a mile every hour for 1000 consecutive hours. Sharon said: "It is hard being woken up every hour, and sometimes my feet have been sore and my asthma caused a problem, but it has been easier than I imagined." The challenge is modelled on the one completed by Captain Robert Barclay in 1809, regarded at the time as the greatest feat of human endurance ever attempted. "Captain Barclay's diary described it as such a horrendous struggle and basically pain, pain, pain," said Sharon. "But it hasn't really been hard." For the last few days Sharon and her fellow runners have been in London in preparation for the marathon. "We haven't had contact with the outside world for six weeks," she said. "That has been the hardest part. "Mind you, I hate London. "I can't wait to get home for some peace and quiet."